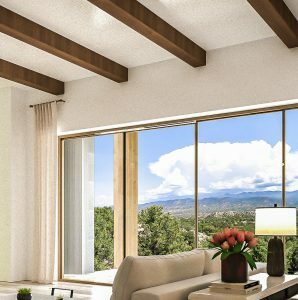 Below are KeyVision Interiors’ unique 3D Photorealistic Renderings not actual photographs, but high level, artistically generated images that capture your ideal vision of your home. This is a huge benefit to our clients because you can actually see your finished project before a single wall has been touched. No dust, no mess, no inconvenience. Our state-of-the-art 3D Photorealistic Renderings takes the guesswork entirely out of the equation. Kelly’s designs take your ordinary room and transform it to an extraordinary room. WALLS have either been entirely removed, opened up with arches, embellished with wall coverings like paint, silk fabrics and piping, high end wallpaper, Venetian plaster, diamond plaster finish, mirrored to amplify a small room or reflect a great view, grass cloth, trompe l’oeil painted, Italian leather screens as backdrops, shiplap on walls, mirrored, exotic stones. 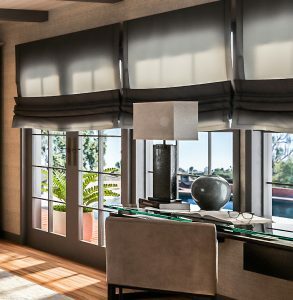 WINDOWS have been designed, like NanaWalls, Folding Glass Walls, floor to ceiling windows, French doors, Bay windows, double hung windows, and skylights, optical illusions with mirrored French doors to give the illusion of space beyond, Lutron automated window treatments, privacy window frosting and so much more. CEILINGS have been designed as vaulted, exposed, coffered, paneled, coved, beams added, mirrors, moldings installed, tromp l’oeil painted, beautiful fabrics, tin plated and acoustic tiles. FIREPLACES have been designed where once there were none, or decorative stone, carved wood, marbled mantels and surrounds, including modern linear fireplaces, traditional fireplaces reimagined, outdoor fireplaces and on and on. DOORS & DOORWAYS have been created where once there were none, using various materials such as ornate glass doors, original antiques, wood-paneled, ornamental irons, pivot doors, custom created/beveled metal doors. 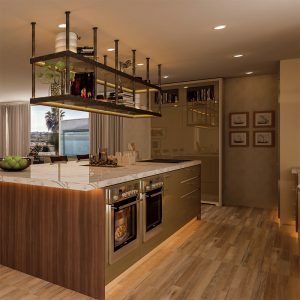 LIGHTING has been created to transform darkened rooms, add special lighting effects, chromatherapy, kitchen chandeliers where none existed, updated LED lighting, skylights to open spaces and bring natural light in, pendants, swags, floor lights, spectacular lamps, under counter lighting.